Please, allow me to go out on this limb: Christopher Nolan has been good for the Batman series. The Dark Knight Rises, opening today, is receiving stellar reviews, and early screenings suggest there aren't any retractable ice skates, or ice-related puns, or enormous polyurethane phalluses (don't ever watch the Batman and Robin director's cut.) One other thing there isn't: An enormous, bombastic soundtrack single like Seal's "Kiss from a Rose," launched off the Batman Forever soundtrack. 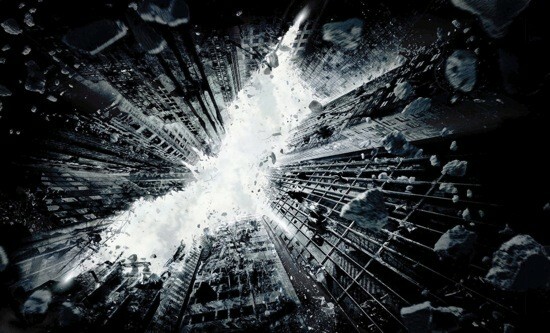 The Dark Knight's wub-wub-wub-wub sonar effects for when anything on screen moved past the camera have proved remarkably influential in action films already, and don't get nearly enough credit for inventing dubstep, but can you turn up the volume on your Discman speakers and woo a lady with them? Okay, but if she isn't into dubstep? Seal, on the other hand. Seal could get into anyone's mom jeans, and for good reason--nearly 20 years after the fact, I still can't help but nod whenever it goes quiet-loud on an adult-contemporary station. In that way it's the only Batman movie to map properly to contemporary pop music (and culture), which is an entirely unserious pursuit that still forces its artists into awkward-fitting roles as Designated Generational Metonyms. (I'm glad we decided the decade of Ronald Reagan and personal computers is best represented by its children's intermittent fondness for Cyndi Lauper.) Batman Forever is ridiculous, but it's also slick and coherent, and if it's on I have to make myself not watch it. If it were a song, it would be "Kiss from a Rose." If Batman, the Michael Keaton original, were a song, it would have to take into account the fact that the Batman in that movie wore plaid instead of a rubber suit, and was cloned a bunch of times, and never really fought crime so much as tried to deal with the fact that he'd been cloned a bunch of times, especially as it related to his relationship with his nearly estranged family. It was a pretty funny movie, but I always thought calling it Batman was kind of misleading. One man's opinion. Batman Returns, meanwhile--I think the era-appropriate comparison would be to the Smashing Pumpkins' "Disarm." Sometimes you're listening to an inherently depressing Smashing Pumpkins song, or watching an inherently depressing Tim Burton Batman movie, and you just think--I wonder if this comes in Even Sadder? It does. There are church bell samples, and Danny DeVito enacts a Biblical plague. Then: A well-justified reboot, the likes of which the Spider Man series could only dream of. But I'm not sure Batman Begins and The Dark Knight have a pop equivalent. If they did, I guess it would be some kind of U2 reboot--the critic's arena-rock band, with blunt philosophical implications and a lot of Christ-figure-abuse and record-breaking tour after record-breaking tour. Smart Comic Book Movies, like Socially Aware Arena Rock, are easy to laugh about, and to doubt, but as much as I hated "Vertigo" I'm glad U2 exists; I'd rather bands be too socially responsible than not socially responsible enough. And as ham-fisted as some of the Joker's college-dorm thought experiments were, The Dark Knight was a great movie, and better for making its villain into something more than Arnold Schwarzenegger making ice puns. So I don't doubt The Dark Knight Rises is a great movie. But it's a great movie that, to my infinite regret, has no tonal room for a love scene set to a Seal song.